Supports your hand in an upright neutral posture, avoids forearm twisting. “The patented shape supports your hand in an upright neutral posture that generally avoids forearm twisting. Many users, including medical doctors, ergonomists and physical therapists, said the Evoluent VerticalMouse provides superior comfort and even relieved their wrist pain*. The thumb rest has been reshaped to provide even more comfort over earlier versions. A new bottom thumb button provides greatly extended functionality when used with the included driver. An extra wide lip along the bottom edge prevents the last finger from rubbing the desk. 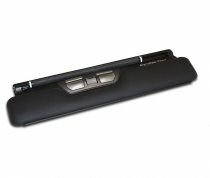 Pointer speed controls on the side allow convenient adjustment without even releasing your grip from the mouse. Top mounted LEDs show through the chrome thumb rest to indicate selected pointer speed including extra low (XL), low (LO), MD (medium), to high (HI). The logo is pure eye candy. The illumination turns off when the system is in sleep mode to conserve notebook battery power. Evoluent Mouse Manager for Windows provides extensive but easy to use functionality for 6 buttons through a simple and intuitive interface. 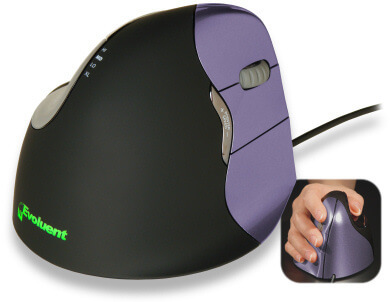 The Evoluent VerticalMouse 2 (an earlier model identical in concept) was evaluated in 2007 by a team at the health services clinic in UC Berkeley, including medical doctors, physical therapists, ergonomists, and administrators. It was found to be comfortable, easily adapted to, and promote a neutral wrist and forearm posture. It was the only vertical type mouse approved for staff use within UC Berkeley and for sale in the campus store at that time. * The statements herein apply to some current or past users of Evoluent VerticalMouse, but since everyone is different, Evoluent makes no claim or representation that the Evoluent VerticalMouse will prevent, cure, or mitigate any medical condition, disease, injury, pain or discomfort for all users.